The Suzuki-gokin is a special maker of resistors and resistance objects. Suitable for current load of medium intensity. By loosely folding the strips, the number of necessary electrical connections is reduced; the simple structure permits easy maintenance and high reliability. Most suited to situations requiring self-cooling, again air cooling at low flow rate is also efficient. Since fine resistance adjustments are possible. This type has a wide range of applications. Suitable for heavy current load over an extended period of time, since the large cooling surface area ensures high air cooling efficiency. Strongly resistant to vibration and impact because the V shape imparts high rigidity. High reliable with low maintenance requirements since electric welding reduces electrical contacts. 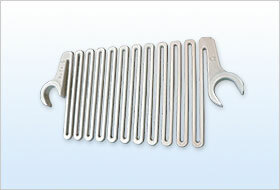 Usable under high temperature conditions because it is supported by heat resisting insulators. 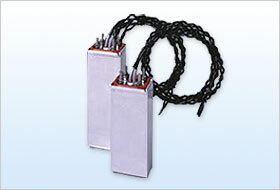 This type has been used as a heavy current resistor, but is now only used in special applications. Since a wide range of sizes, shapes and material characteristics (volume resistivity, magnetism, etc) are available, special orders can be met. 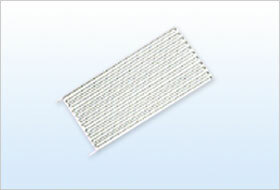 Steel grid resistors of iron-chromium-aluminum alloy, iron-chromium-nickel alloy and other alloys can also be supplied. The most suitable for high voltage and high resistance. The most suitable section to load current is selectable. Attemptable to light in weight and compactness. 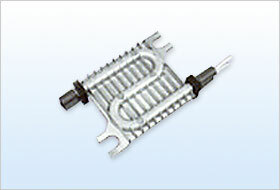 High reliability for heat and electric using porcelain insulators. Most suitable for high resistance or small current loads. High performance and high resistance resistor, which consists of sheathed resistance tube containing nichrome wire, the tube being surfaced with cooling fins for effective cooling and heat storage. Compact and simple to maintain because frame is unit cast, with no live parts exposed. Reduction in weight and size is possible because the oval spiral shape permits close packing of resistors with small sectional areas, within a unit volume. 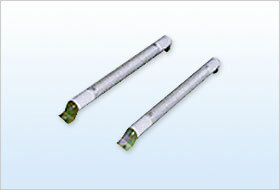 The low -Inductance resistor met the demand of miniaturizing and high reliability of power transform equipment. 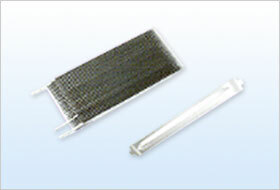 High radiation of heat, simple structure and high reliability using plate type resistor element. 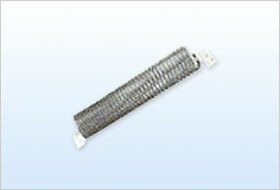 Superior high temperature and withstand high voltage quality using the high quality heat resisting insulator. Humidity and vibration resistance and maintenance-free met the heavy conditions. Wiring terminal and bushing terminal. Copyright (C) 2008 SUZUKI GOKIN CO., LTD. All rights reserved.